During the 17'th century the Dutch established a territory covering all continents; Europe, North, Middle and East America, Africa, Asia and Oceania. The Dutch Empire (Dutch: Nederlands-koloniale Rijk) comprised the overseas territories controlled by the Dutch Republic. The Dutch followed Portugal and Spain in establishing an overseas colonial empire. For this, they were aided by their skills in shipping and trade and the surge of nationalism accompanying the struggle for independence from Spain. Alongside the British, the Dutch initially built up colonial possessions on the basis of indirect state capitalist corporate colonialism, via the Dutch East and West India Companies. Dutch exploratory voyages such as those led by Willem Barentsz, Henry Hudson and Abel Tasman revealed vast new territories to Europeans, particularly in the Arctic Sea, North America, in the Pacific, Australia, and New Zealand. With Dutch naval power rising rapidly as a major force from the late 16th century, the Netherlands dominated global commerce during the second half of the 17th century during the Dutch Golden Age. Amboina was captured from the Portuguese in 1605, but an attack on Malacca the following year narrowly failed in its objective to provide a more strategically located base in the East Indies with favorable monsoon winds. The Dutch found what they were looking for in Jakarta, conquered by Jan Coen in 1619, later renamed Batavia after the putative Dutch ancestors the Batavians, and which would become the capital of the Dutch East Indies. Meanwhile, the Dutch continued to drive out the Portuguese from their bases in Asia. Malacca finally succumbed in 1641 (after a second attempt to capture it), Colombo in 1656, Ceylon in 1658, Nagappattinam in 1662 and Cranganore and Cochin in 1662. The Dutch had many setllements in India and Goa, the capital of the Portuguese Empire in the East, was unsuccessfully attacked by the Dutch in 1603 and 1610. Whilst the Dutch were unable in four attempts to capture Macau from where Portugal monopolized the lucrative China-Japan trade, the Japanese shogunate's increasing suspicion of the intentions of the Catholic Portuguese led to their expulsion in 1639. Under the subsequent sakoku policy, from 1639 till 1854 (215 years) the Dutch were the only European power allowed to operate in Japan, confined in 1639 to Hirado and then from 1641 at Deshima. In the mid 17th century the Dutch also explored the western Australian coasts, naming many places. The Dutch colonized Mauritius in 1638, several decades after three ships out of the Dutch Second Fleet sent to the Spice Islands were blown off course in a storm and landed in 1598. They named it in honor of Prince Maurice of Nassau, the Stadtholder of the Netherlands. The Dutch found the climate hostile and abandoned the island after several further decades. The Dutch established a colony at Tayouan (present-day Anping), in the south of Taiwan, an island then largely dominated by Portuguese traders and known as Formosa; and in 1642 the Dutch took northern Formosa from the Spanish by force. In 1646, the Dutch tried to take the Spanish colony in the Philippines. The Dutch had a large force at their disposal but when they tried to take Manila, they were defeated at the Battles of La Naval de Manila. After this defeat, the Dutch abandoned their efforts to take Manila and the Philippines. Between 1602 and 1796, the VOC sent almost a million Europeans to work in the Asia trade. The majority died of disease or made their way back to Europe, but some of them made the Indies their new home. Interaction between the Dutch and native population mainly took place in Sri Lanka and the modern Indonesian Islands. Through the centuries there developed a relatively large Dutch-speaking population of mixed Dutch and Indonesian descent, known as Indos or Dutch-Indonesians. In the Atlantic, the West India Company concentrated on wresting from Portugal its grip on the sugar and slave trade, and on opportunistic attacks on the Spanish treasure fleets on their homeward bound voyage. 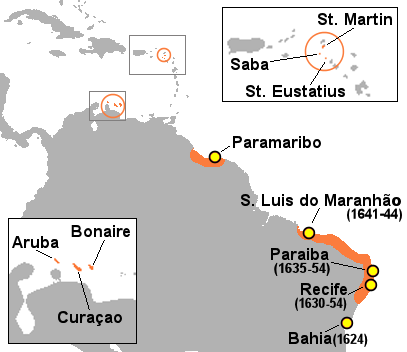 Bahia on the north east coast of Brazil was captured in 1624 but only held for a year before it was recaptured by a joint Spanish-Portuguese expedition. In 1628, Piet Heyn captured the entire Spanish treasure fleet, and made off with a vast fortune in precious metals and goods that enabled the Company two years later to pay its shareholders a cash dividend of 70%, though the Company was to have relatively few other successes against the Spanish. 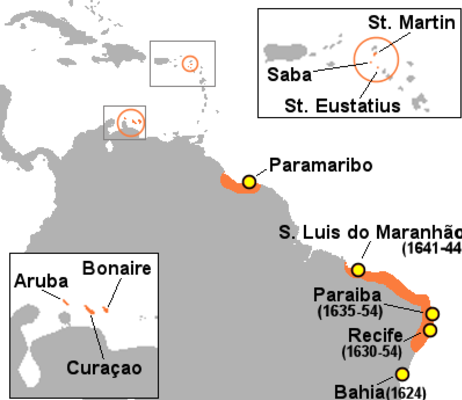 In 1630, the Dutch occupied the Portuguese sugar-settlement of Pernambuco and over the next few years pushed inland, annexing the sugar plantations that surrounded it. In order to supply the plantations with the manpower they required, a successful expedition was launched in 1637 from Brazil to capture the Portuguese slaving post of Elmina, and in 1641 successfully captured the Portuguese settlements in Angola. In 1642, the Dutch captured the Portuguese possession of Axim in Africa. By 1650, the West India Company was firmly in control of both the sugar and slave trades, and had occupied the Caribbean islands of Sint Maarten, Curaçao, Aruba and Bonaire in order to guarantee access to the islands' salt-pans.Unlike in Asia, Dutch successes against the Portuguese in Brazil and Africa were short-lived. Years of settlement had left large Portuguese communities under the rule of the Dutch, who were by nature traders rather than colonizers. In 1645, the Portuguese community at Pernambuco rebelled against their Dutch masters, and by 1654, the Dutch had been ousted from Brazil. In the intervening years, a Portuguese expedition had been sent from Brazil to recapture Luanda in Angola, by 1648 the Dutch were expelled from there also. On the north-east coast of North America, the West India Company took over a settlement that had been established by the Company of New Netherland (1614–18) at Fort Orange at Albany on the Hudson River, relocated from Fort Nassau which had been founded in 1614. The Dutch had been sending ships annually to the Hudson River to trade fur since Henry Hudson's voyage of 1609. To protect its precarious position at Albany from the nearby English and French, the Company founded the fortified town of New Amsterdam in 1625, at the mouth of the Hudson, encouraging settlement of the surrounding areas of Long Island and New Jersey. The fur trade ultimately proved impossible for the Company to monopolize due to the massive illegal private trade in furs, and the settlement of New Netherland was unprofitable. In 1655, the nearby colony of New Sweden on the Delaware River was forcibly absorbed into New Netherland after ships and soldiers were sent to capture it by the Dutch governor, Pieter Stuyvesant. Since its inception, the Dutch East India Company had been in competition with its counterpart, the English East India Company, founded two years earlier but with a capital base eight times smaller, for the same goods and markets in the East. In 1619, the rivalry resulted in the Amboyna massacre, when several English Company men were executed by agents of the Dutch. The event remained a source of English resentment for several decades, and indeed was used as a cause célèbre as late as the Second Anglo-Dutch War in the 1660s; nevertheless, in the late 1620s the English Company shifted its focus from Indonesia to India. By the middle of the 17th century, the Dutch had overtaken Portugal as the dominant player in the spice and silk trade, and in 1652 founded a colony at Cape Town on the coast of South Africa, as a way-station for its ships on the route between Europe and Asia. After the first settlers spread out around the Company station, nomadic white livestock farmers, or Trekboers, moved more widely afield, leaving the richer, but limited, farming lands of the coast for the drier interior tableland. In 1795, the heavily taxed Boers of the frontier districts, who received no protection against the Africans, expelled the officials of the Dutch East India Company, and established independent governments at Swellendam and at Graaff-Reinet. In 1651, the English parliament passed the first of the Navigation Acts which excluded Dutch shipping from the lucrative trade between England and its Caribbean colonies, and led directly to the outbreak of hostilities between the two countries the following year, the first of three Anglo-Dutch Wars that would last on and off for two decades and slowly erode Dutch naval power to England's benefit. The Second Anglo-Dutch War was precipitated in 1664, when English forces moved to capture New Netherland. Under the Treaty of Breda (1667), New Netherland was ceded to England in exchange for the English settlements in Suriname, which had been conquered by Dutch forces earlier that year. 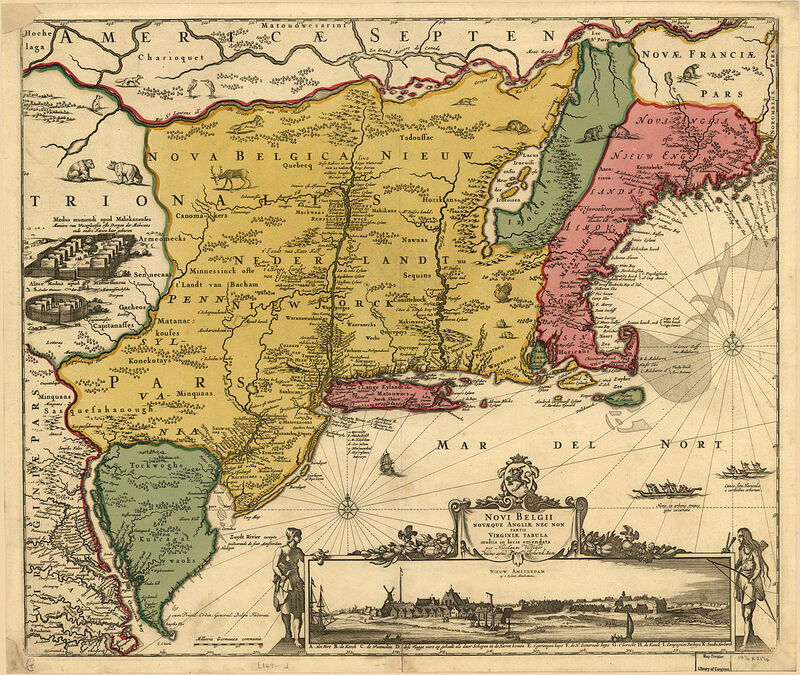 Though the Dutch would again take New Netherland in 1673, during the Third Anglo-Dutch War, it was returned to England the following year, thereby ending the Dutch Empire in continental North America, but leaving behind a large Dutch community under English rule that persisted with its language, church and customs until the mid-18th century. In South America, the Dutch seized Cayenne from the French in 1658 and drove off a French attempt to retake it a year later. However, it was returned to France in 1664, since the colony proved to be unprofitable. It was recaptured by the Dutch in 1676, but was returned again a year later, this time permanently. The Glorious Revolution of 1688 saw the Dutch William of Orange ascend to the throne, and win the English, Scottish, and Irish crowns, ending eighty years of rivalry between the Netherlands and England, while the rivalry with France remained strong. During the American Revolutionary War, Britain declared war on the Netherlands, the Fourth Anglo-Dutch War, in which Britain seized the Dutch colony of Ceylon. Under the Peace of Paris (1783), Ceylon was returned to the Netherlands and Negapatnam ceded to Britain. In 1795, the French revolutionary army invaded the Dutch Republic and turned the nation into a satellite of France, named the Batavian Republic. Britain, which was at war with France, soon moved to occupy Dutch colonies in Asia, South Africa and the Caribbean. Under the terms of the Treaty of Amiens signed by Britain and France in 1802, the Cape Colony and the islands of the Dutch West Indies that the British had seized were returned to the Republic. Ceylon was not returned to the Dutch and was made a British Crown Colony. After the outbreak of hostilities between Britain and France again in 1803, the British retook the Cape Colony. The British also invaded and captured the island of Java in 1811. In 1806, Napoleon dissolved the Batavian Republic and established a monarchy with his brother, Louis Bonaparte, on the throne as King of The Netherlands. Louis was removed from power by Napoleon in 1810, and the country was ruled directly from France until its liberation in 1813. The following year, the independent Netherlands signed the Anglo-Dutch Treaty of 1814 with Britain. All the colonies Britain had seized were returned to the Netherlands, with the exception of the Cape Colony and Guyana.